How do you role-play a character who is smarter than you are? It's easy to role play someone who's dumber than you. The person role playing the classic half-orc barbarian in Dungeons and Dragons should be chock full of phrases like "Grurk no understand" and "What Grurk missing?" That player must simply imagine that his logical reasoning skills are not enough to put together the various pieces of plots that the dungeon master narrates. But playing a character more intelligent than the player is more difficult: how do you pretend to be smarter than you are? I looked to fiction to answer this question. How do authors write characters that are smarter than they are? And for this, I turned to Sir Arthur Conan Doyle and his famously (extraordinarily) intelligent character Sherlock Holmes. Holmes is so smart because he has access to information that no ordinary human could could possibly have in his situation. Holmes's intelligence is displayed in the same way an actor in a play might demonstrate a character's absurd strength by lifting a boulder which is actually made of foam. In short, Doyle cheats by building a world around his character in which the character can succeed. This line of inquiry inspired me to try my hand at designing a game in which a player could role-play a Holmes-like detective who was smarter than the player herself. As I learned from Doyle, in order to role-play such a character, the player must have control over the world. This way, the character can make inferences that the player could not in his or her shoes, and then the player can warp the world so that these inferences can turn out to be true. This kind of world manipulation by players is what happens in joint storytelling roleplaying games. In these games, players trade off adding to a story. Joint storytelling itself is very simple; the well known games Three Word Story (in which players alternate adding three words to the end of a story) and Exquisite Corpse (in which players alternate adding words to the end of a passage, but don't get to read the passage, only the last few words) are both examples of this mechanic. When an role-playing element is added, it often comes with power imbalances among the players. A great example of this genre is Inspectors. The game uses a traditonal table top role-playing model where which several players each role-play a character, and say what that character does in the world. They often have to make dice rolls to determine whether or not they succeed at the actions they declare their characters attempt. If they roll high enough, they get to say what the result is, but if they roll too low then the game master determines the result. Consulting Detective (as I am now calling the game) is a joint storytelling game. I decided to design it for two players so as not to muddy the waters. It is played with one Game Master, who effectively plays the part of the mystery, attempting to confound the Detective's interpretation of the clues, and one Detective, who attempts to incorporate all clues into a coherent explanation for what happened. The game is played over a series of eight clues. Some clues are offered by the Detective, and some are offered by the Game Master. Offering a clue has two phases: posing the clue, and resolving the clue. Posing is extremely simple: this is simply a statement of what the Detective does to gain this information. For example, "I pick the lock on the safe" could be a clue posed by the Detective. Resolving the clue is a statement of what information the Detective finds. For the same example, "In the safe you find pictures of what appears to be the deceased victim and his identical twin brother." Finally, it's important to note that clues are not always posed and resolved by the same person. For most of the game, the Detective poses clues, and then flips a coin. If heads, she may resolve the clue. If tails, the Game Master resolves the clue. This is unusual for a role playing game in that the Detective succeeds at the attempted action whether or not she wins the coin flip. The coin flip determines who will describe the clue that the investigation reveals. In the above example, even if the Detective fails the flip, she still succeeds in opening the safe; she just doesn't get an opportunity to say what is inside. Problem: "Mrs. White's husband left to get groceries last night and never returned." Clue 1: (GM Pose) You ask her if her husband has been known to stay out late drinking or perhaps seeing a mistress. (GM Resolution) She replies that he is a very pious man and he would never do either of those things. Clue 2: (GM Pose) You glance at her shoes... (GM Resolution) and notice that they are brand new, almost never been worn. The second phase is called In Quest of a Solution. In the original work, this usually takes the form of a more extensive questioning of the client, investigation of a crime scene, or undercover work chasing clues around the city (sometimes a bit of all three). In Consulting Detective, this phase consists of four clues, all posed by the Detective. After posing a clue during the second phase, the Detective flips a coin. If she wins, she resolves the clue. If she loses, the Game Master resolves the clue. Finally, the Detective may skip the coin flip for two of these clues, and automatically be allowed to resolve them. 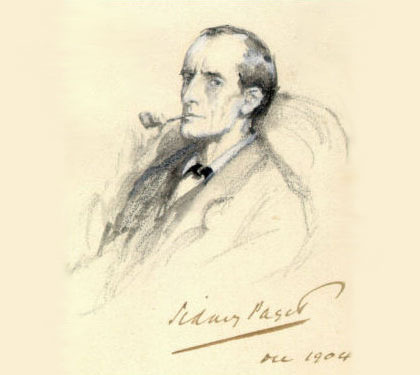 Sherlock Holmes is known to narrow down the possible solutions to a case as he collects more data. When he has a few clues he might have eight possible theories that explain them all. As he uncovers more data, the explanations dwindle, until he finally has enough information to exclude all theories except one. This design intends to capture the feeling of narrowing possibilities. In the third phase, the Game Master poses two clues. Each of these clues' resolution is determined by a coin flip. This corresponds to Sherlock's desire to confirm his theories by going out and finding one or two more clues merely for verification. After these last clues comes the big reveal. This is a distinct marker of Sherlock Holmes stories as opposed to traditional crime mysteries: Sherlock Holmes almost always saves his interpretations of the clues until the very end, instead of piecing things together for the audience as he goes along. Consulting Detectives takes this element of the plot very seriously. After all eight clues have been posed and resolved, the Detective has a chance to explain what happened in the case while incorporating all eight clues. If she cannot think of such an explanation, the Game Master has an opportunity to explain what happened, again including all of the clues. If he cannot think of one either, the Detective gets another opportunity to explain, but may deem one of the clues irrelevant. If she cannot, the Game Master gets another attempt with one clue omitted. This continues until one player can give a coherent explanation of what happened, and that player is the winner. Strangely enough, this design was heavily influenced by the spelling game GHOST. My friends and I used to play this game on bus rides, as it requires no components. The first two rules are extremely simple: players take turns adding one letter to the end of a word, and if anyone completes a word they lose. For example, Max says "C." Nick adds "A," making the word fragment "CA." Max adds "T" and loses since he spelled "CAT." The third rule, however, really makes the game: on your turn you can challenge your opponent to finish the word. If he or she cannot, you win. This ensures that whenever you add a letter, you are thinking of a particular word. For example, Max: C, Nick: A, Max: U. Nick challenges because he can't think of a word that is spelled "CAU." Max had been thinking of the word CAUCUS. In short, the object of the game is to think of a word that stumps the other player. In GHOST, whenever a player adds a letter, he must have in mind a word that could be spelled, or else he will lose of his opponents challenge him. Similarly, in Consulting Detective whenever a player adds a clue, it is in her best interest to have in mind an explanation of the case that incorporates all clues to date, and the new one. Otherwise, when it gets to the the big reveal, she will not be able to offer an explanation with all of the clues. This concept is all well and good, but there are still several design questions to answer through testing. Most of these questions resolve around the nitty-gritty clue order. Is eight too many clues for either player to be able to offer a good explanation? Although each player gets the same number of clue poses and resolutions, is it unfair to either player because the later ones are more important than the earlier ones? But other questions include: should the Detective have stats that she can allot to various detecting skills such as observation, disguise, and manipulation? In all, I'm happy with the concept of this game, and will be testing it more in the coming weeks, so look forward to a revision. In the mean time, you could test it too, and let me know what you think!